Iconic Mereenie Loop open by autumn – at last! 2017 will kick off with an event likely to revolutionise The Centre’s tourism industry – the opening of the long awaited seal of the Inner Mereenie Loop. Thousands of grey nomads will have a superb new place to play. People in the most ordinary 2WD cars will be able to drive from Alice to Alice via the iconic Aboriginal township of Ntaria (Hermannsburg), the Gosses Bluff meteorite crater, Glen Helen and back via the breathtaking West MacDonnells – all the way on bitumen, around 400 kilometres, and not a single traffic light. They will be crossing twice the Hugh River and the mighty Finke, the oldest river in the world. There are side roads to our gems including Redbank Gorge, Ormiston, Ellery Bighole and Standley Chasm – enough for a couple of weeks in some of the world’s least polluted country. The Mereenie Loop was initially intended as leading to Uluru but the alternative route under construction now is a boon for the Alice-based tourism industry, long struggling against the competition from the Ayers Rock Resort. Government money for the Inner Loop had been moved from Budget to Budget for some years. According to a spokeswoman for the Department of Infrastructure, the project is worth $28.3m. $25m was allocated in 2015-16 and in 2016-17 an additional $3.3m program increase was approved, funded through the Australian Government Asset Recycling Initiative. The works were awarded as a “managing contractor” deal to local company Sitzler in December 2015 which included all planning and design and construction works. Actual construction started in September this year and the first 20 kms are scheduled for completion this month. The remaining 20 kms are to be sealed, line marked and completed by end of February 2017. All works are expected to be complete and open to the public by end March 2017. The 40km road from Hermannsburg to Glen Helen is being built by Black Cat, Exact Mining Services and Ostojic. The evidence stares us in the face. The Finke traverses (travels across) the prominent ranges (in photo) so has been in existence since the beginning of their upheaval over 300,000,000 years plus to the present day, ED. @ Ian Sharp: The river has not evidentially changed course over time? Hi Ian Sharp: I give up. Please tell all! Merry Christmas, Erwin, Editor, Alice Springs News Online. 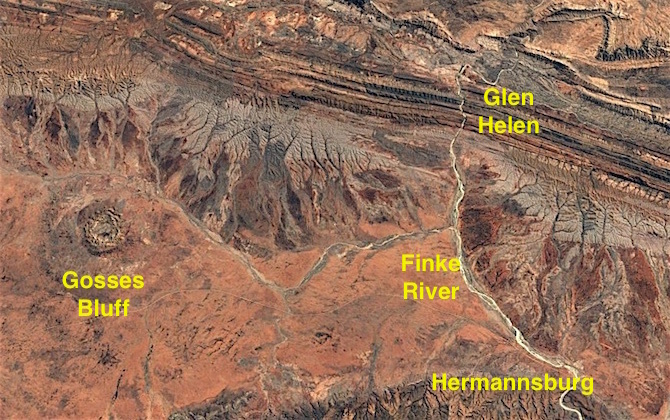 Hi Erwin … the Finke is the oldest river in the world. What is the evidential proof of this oft stated “fact”? Hint: look at the aerial photo illustrating your story. Sadly Alex’s insightful commentary is likely to be the reality. On the bright side, we soon going to have a fantastic road for motorcycling. It’s interesting to note that the scheduled completion of the Inner Mereenie Loop road by end of March next year will be exactly 30 years since the official opening of the sealed south Stuart Highway in 1987. In turn it had taken about 30 years of lobbying before the Fraser Government announced in September 1982 that the south Stuart Highway would be sealed as part of the national Bicentenary road-funding program. The completion of the Stuart Highway in South Australia opened the floodgates to tourist road traffic in the Centre. By September 1987 the tourism minister Ray Hanrahan stated the “increase in tourist road traffic in remote areas of Central Australia has been staggering” and that “it appears almost nowhere is considered too remote anymore”. He “attributed the increase to the sealing of the Stuart Highway south of the border” and – significantly – “there was a 250% increase in visitor numbers at Yulara earlier this year”. The period between 1987 to August 1989 was the pinnacle of the tourism industry in the NT, especially in the Centre. It was during this time that the NT Government commissioned Horwath and Horwath as consultants to study the development potential of the tourism industry in Central Australia. As fate would have it, Chief Minister Marshall Perron released the study in November 1989 during the aftermath of the national pilots’ strike, which had dealt a crippling blow to the local tourist industry from which it has never fully recovered. The study stated that “a proposed multi-million dollar West MacDonnell Ranges tourist development could put Central Australia in the top five of Australian tourist attractions” and “could rival Sydney, the Gold Coast, the Whitsundays and North Queensland”. The report recommended “the area, extending 200km west of Alice Springs, incorporate a hotel, caravan parks, camping grounds, a museum, a safari wilderness camp and a simulated cattle station. “The key to the proposed development would be a tourist circuit ring-road linking major attractions and allowing tourists to visit Alice Springs, Glen Helen, Kings Canyon and Yulara on a round trip. “The report states the ring-road would mean increased tourists to the Centre – more than 500,000 by 1990-91 and 1.3 million by the year 2000. Glen Helen Gorge is recommended as the ‘gateway’ to the new development with a 100 to 200 room motel, licenced bars, tennis courts, games rooms, bike hire and horse-riding”. It went on to state “the development should be aimed at showing tourists the real Australia in a setting renowned for its spectacular scenery”. Notwithstanding all of this positivity, Marshall Perron sounded a note of caution, warning that “it would be a long time before the proposal became a reality [as] the cost implications for the Government are very heavy” – but he probably didn’t foresee that over a quarter of a century later we would only now be on the verge of completion of a much reduced Inner Mereenie Loop Road that falls far short of the original vision. Not only that but we now have underway another study for a masterplan for development of the West Macs as a major tourist destination. It will be interesting to see how much it reiterates the study released in 1989. So will the Inner Mereenie Loop Road “revolutionise The Centre’s tourism industry” where “thousands of grey nomads will have a superb new place to play” a la the south Stuart Highway in 1987? There’s several problems with this over-optimistic expectation. Recently I visited the Hermannsburg Historical Precinct and learned “the iconic Aboriginal township of Ntaria (Hermannsburg)” is falling a long way short of viability as a tourist destination – and a major part of the problem is that grey nomads are NOT big spenders. On the contrary, they tend to be highly frugal with their money, carefully budgeting expenditure for each day. It’s unlikely that the sealing of the loop road of itself will lead to a bonanza for tourism for The Centre. Alice Springs itself provides a clear demonstration of this folly. Millions of dollars was spent on re-opening the north end of Todd Mall to traffic again with the expectation this will lead to increased patronage of shops in this vicinity; instead it remains a quiet precinct with several empty shop fronts and more closing (in the mall or the adjacent shopping centre), easily offsetting any new enterprises that have recently opened. Far more ominous is that circumstances today are uncannily reminiscent of conditions that prevailed at the time of the tourism study in late 1989, when there was a general pervasion of gloom in the town and the nation ahead of the onset of a major economic recession in the early 1990s. This was the situation which led to that consultancy’s report and recommendations for tourism development in the West Macs quickly vanishing from public prominence and fading from our corporate memory. It seems that history is repeating. Presumably this article is written for readers in the northern hemisphere?